The C16 Wayne Goddard is a collaboration model and the design is unique and goes back to a custom model of Mr. Wayne Goddard, called “Odin’s claw”. The Wayne Goddard with Micarta handles appears in the 1993 product guide, the 1994 product guide, the 1997 product guide and the 1998 product guide. The Wayne Goddard with black FRN handles appears in the 1997 product guide, the 1998 product guide and the 2000 product guide. The prototype Goddard/Spyderco folding knife was delivered to Sal Glesser during May 1990. The first production models were delivered November 1991. These C-16 knives came with black Micarta handles and full serrated or partially serrated blades. The full serrated blade was discontinued in 1996. We received the prototype of the GRN (Zytel type material) handled C-16 on January 17, 1997. It was a good looking knife with the cast handle and the new, right/left interchangeable clip. It also had the new steel, ATS-55. The Lightweight Goddard was the first Spyderco Clipit to feature ATS-55 and the changeable Clipit. We received the first production Lightweight Goddard's in May of '97; these were partially serrated. The first Lightweight Goddard's with plain edge blades were delivered in May '99. The Lightweight was well received and sales were very good. Spyderco did a sprint run of 1,200 Lightweight Goddard's with a gray handle in early 2004. These blades featured VG-10 stainless steel. We received the first shipment May 21, 2004. Most of that shipment was partially serrated, but some were plain edged. Over thirty years ago, Wayne Goddard set out to create a heftier, stronger knife that would hold a better edge. Today Wayne is a historian of the folding knife and creator of this Spyderco/Goddard collaboration series. This design is a composite of hundreds of different Goddard folders and is available in three sizes. The 50/50 combination blade incorporates the Spyderco Trademark Round Hole and eliminates the “hump” just above the hole. The blade has just enough belly to be effective, and the tip is reinforced to accommodate heavy-duty work. The slim scales are made of Micarta to provide strength, lightweight handling and attractive styling. The handle includes a built-in “guard” to provide optimum protection against sliding up on the blade, and the clip is positioned high on the knife for convenient carry (note that the Baby Wayne Goddard does not have a clip). Each of the three sizes performs well in a variety of situations, and each makes a great utility tool.. The knife in itself features a sturdy drop-point blade, hollow saber grind, Mar-McBurnettte front lock, clip and opening hole. The designer’s signature is etched onto each blade. The micarta handled knives have the standard clip for tip-down, the FRN variations offer ambidextrous clip for tip-up carry. All are made in Seki city, Japan and the lock is a Mar-McBurnette front lock. Other known variations in collaboration with Mr. Wayne Goddard: C18 Wayne Goddard Jr. and C20 Baby Wayne Goddard. The 1998 OKCA knife, wich was ordered by the Oregon Knife Collectors Association as their 1998 Club Knife, is seen by some as the most collectible variation. 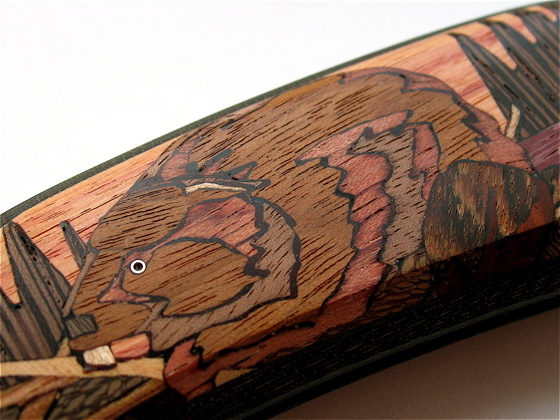 Limited to 60 knives, these were made by Santa Fe Stoneworks with a special wood inlay on the front representing a beaver with a lake/wood scenery. SFSW used only woods from Oregon. - Was there ever a micarta C16 Goddard made in plain edge version? C16 ? ? ? ? ? ? ? C16BK ? ? ? ? ? ? ? C16BRG ? ? ? ? ? ? ? The Wayne Goddard with grey FRN on Spyderco's website. This page was last modified on 29 April 2015, at 05:22.